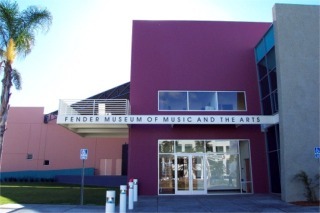 This is the Fender Museum of Music and the Arts in Corona California. Because of the angle of the sun I couldn't get a picture of the entire facility. It was opened in July 0f 2002 and is 33,000 sq. feet. 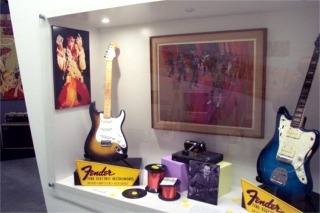 The museum has quite a few displays of guitars and some of Fender's history. It is a great start but they are kind of missing the point. 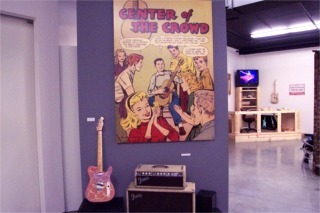 For people like Karen and I who know nothing about the guitar and Fender the displays didn't teach us much. They showed all the different models such as the Stratocaster, Jazzcaster, Telecaster and other ending in caster but nowhere did I see an explanation of what these names meant. 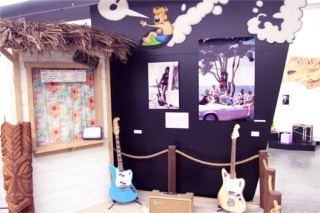 This display shows Jimi Hendrix who evidently used Fender guitars. 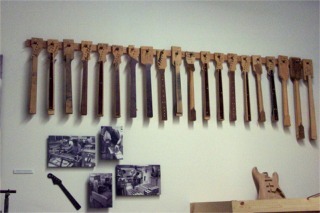 There is one area where a video is running showing the manufacturing of the guitars but it has no narration to explain it. Anyway, the price of admission is right at $3 each and the displays are interesting. I only wish there would have been more explanations on some of it for the person who isn't a guitar buff. I understand there is a very interesting history behind the company but I had to come home and read it on the internet. Since the museum has not been officially open even a year I hope they will get better at it.